LETHBRIDGE, Alta. 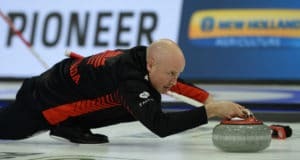 – For the second straight game Kevin Koe and Team Canada scored a three-ender early and used the lead to control the game and finish the opening day of the 2019 Pioneer Hi-Bred World Men’s Curling Championship, presented by Service Experts Heating, Air Conditioning and Plumbing, at 2-0. LETHBRIDGE, Alta. – It wasn’t easy and it wasn’t pretty, but Kevin Koe began pursuit of a third world championship Saturday with a 6-5, extra-end win over SooHyuk Kim of South Korea in the opening draw of the 2019 Pioneer Hi-Bred World Men’s Curling Championship, presented by Service Experts Heating, Air Conditioning and Plumbing. 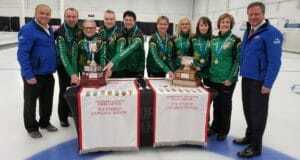 Saskatchewan’s Bruce Korte and Sherry Anderson are wearing gold medals after the finals of the 2019 Everest Canadian Seniors wrapped up on the ice of The Chilliwack Curling Club in Chilliwack, B.C., today. 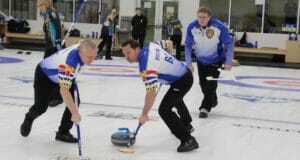 The playoffs match-ups are set as the Championship Round wrapped up on Wednesday evening at the 2019 Everest Canadian Seniors Curling Championships in Chilliwack, B.C. 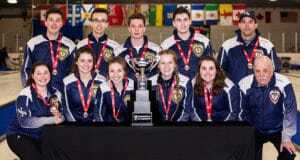 Future Canadian curling stars are converging in Sherwood Park, Alta., for the third edition of the Canadian Under-18 Boys and Girls Curling Championships, beginning on Tuesday at the Glen Allan Recreation Complex. The championship round got underway Tuesday morning at the 2019 Everest Canadian Seniors Curling Championships in Chilliwack, BC., with the leaders after the round robin starting their quest to secure a spot in the playoffs. Canada’s representatives in the 2019 Pioneer Hi-Bred World Men’s Curling Championship, presented by Service Experts Heating, Air Conditioning and Plumbing, won’t have far to travel. The Championship Pools are set in both men’s and women’s pool play as the round robin finished up Monday afternoon at the 2019 Everest Canadian Seniors Curling Championships in Chilliwack, B.C. (Story by Robyn Mattie) Ontario’s Sherry Middaugh, Karri-Lee Grant, Christine Loube and Jane Hooper-Perroud from the Thornhill Club are having plenty of success at the 2019 Everest Canadian Seniors Curling Championships in Chilliwack, B.C. They’re sitting on a 5-0 record and are guaranteed a spot in the Championship pool. But these women – the 2018 bronze medallists – can’t help thinking how much has changed from a very similar situation just one year ago. Several teams remain undefeated at the top of the men’s and women’s standings after two days of round robin competition at the 2019 Everest Canadian Seniors Curling Championships in Chilliwack, B.C. FREDERICTON, N.B. — The field of teams is beginning to shrink at the 2019 Canadian Mixed Doubles Curling Championship. Twelve started the day at Willie O’Ree Place on Saturday morning and now only four remain. While mixed doubles takes less time to play than the traditional game, John Morris knows it’s tougher on the body. 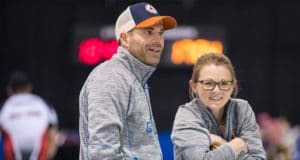 He and partner Jolene Campbell clinched the top spot in Pool D and earned a bye into the quarter-finals at the 2019 Canadian Mixed Doubles Curling Championship. The extra time off is more than welcomed this late into the event.